Some hire specific staff to deal with invoices and key the information into huge databases then file the documents away while others try and do the job between the work they are actually paid to do. The process is time consuming and the storage costs can rack up massively. The storage system is also inefficient when it comes to file retrieval and many an hour can be wasted searching for misfiled invoices. This is where invoice scanning holds the upper hand. Digital invoices take up only virtual space so you can abolish extortionate storage costs or free up much needed office space. 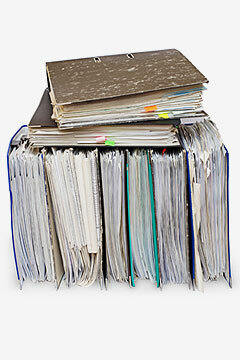 It is much easier to find digital document through a simple text than to have to search through filing systems. You can also share these documents with relevant parties at the click of a button. This quick sharing doesn’t mean just anyone can view the documents though as you can password protect and encrypt the files for extra security. Office efficiency will be increased and more jobs can be completed in a shorter space of time. With the newly organised system and freed up space, office morale can be boosted. Money won’t need to be wasted on extra staff to handle invoices as they can all be handled digitally. Adopting a digital invoice processing system is simple. Firstly invoices need to be gathered and fasteners removed. Then the invoices need to be scanned using a high quality scanner. The scanner will capture all of the data from your accounts payable and purchase ledger documents and display them as an image. The images should then be indexed and OCR processed to make them text searchable. We recommend indexing them by a number of criteria including invoice number, date and supplier name. The files should then be converted to your necessary format and checked for quality. Once you are happy with them, they should be placed onto CD, USB or DVD or hosted over a shared network or in a cloud system. I know what you’re thinking…that sounds like a lot of work, I just don’t have the time or budget for that kind of work!…Have no fear, We are here to lend a helping hand. Here at Pearl Scan we offer invoice scanning and invoice processing services to assist companies in going digital and take away the worry of having to complete the scanning project themselves. Our services are affordable yet effective and our process is safe and secure with a quick turnaround. With our flexible services we can cater for small to large companies with a range of budgets. Our invoice scanning process works exactly like the one above with the added extra of the use of our document management software, Halogen. For more in-depth information about scanning invoices and our invoice data capture services, browse our website and blog articles or get in touch with us today. We can even offer you a free, no obligation quote for your scanning project after completing our online form or giving us a call now.